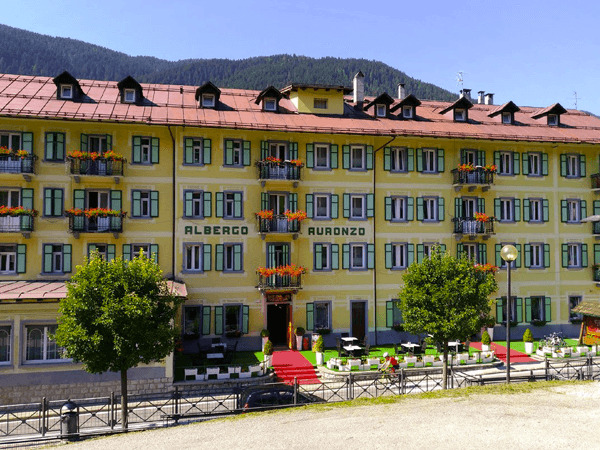 On the banks of the beautiful Lake S. Caterina, you can find the elegant and refined structure of Auronzo Hotel. Just passed the entrance, you will feel like you are in a building from the old times, however with a contemporary touch that makes common spaces very pleasant to experience. 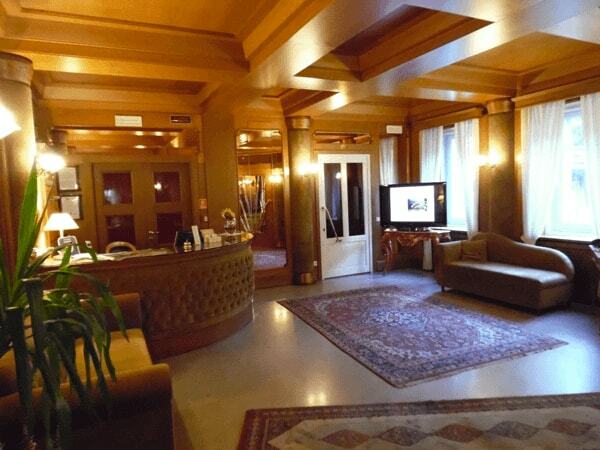 The hotel has been hosting famous characters since 1856, among which we can find numerous popes, general Cadorna, poet Quasimodo and, for around 10 years, S.S. Lazio football team. 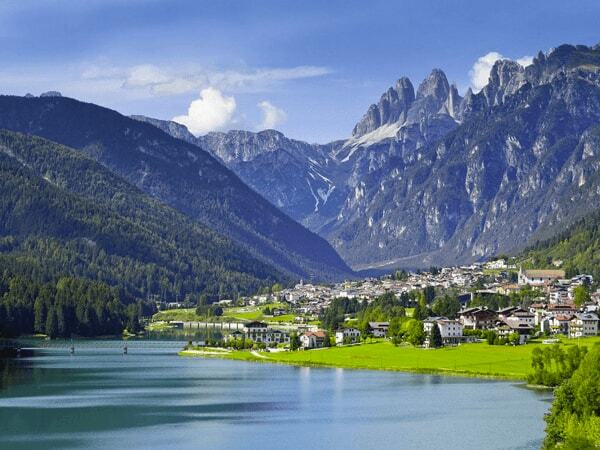 The calm Auronzo di Cadore is ideal to treat yourself to a relaxing stay on the lake. 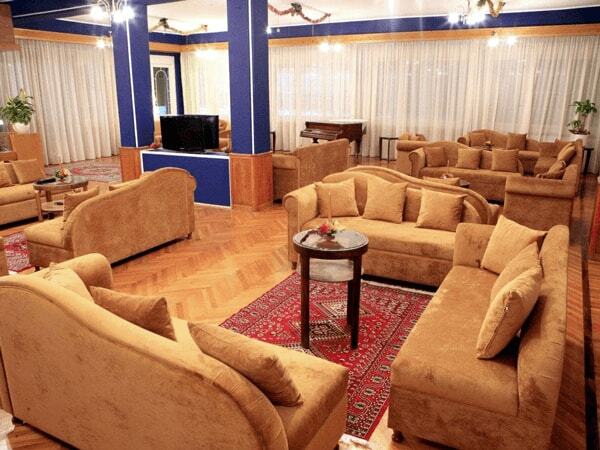 The hotel offers various common spaces where you can spend time in complete relax. The structure has no architectural barriers and offers a reading room, a pool table room and a bar. 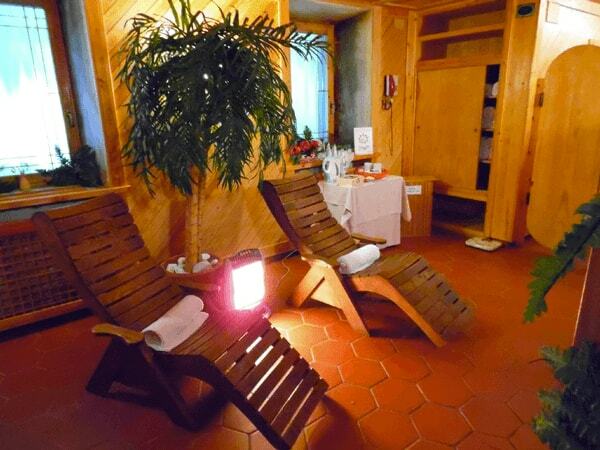 The hotel also has a small yet cozy relax area with sauna, hammam, jacuzzi and tea corner. The appreciated cuisine and the variety of dishes complete the informal and warm welcome offered by the hotel. In the summer time, the Cadore Valley becomes wonderfully colored, offering suggestive views to admire during long walks outside. For the most adventurous, the beauty of the valleys and the picturesque trails of Cadore can also be discovered by renting a bike. The hotel offers instead a summer garden with view on the lake where you can relax yourself. The ski resort of Auronzo Misurina is the absolute protagonist of winter fun, with its 20 km of trails that can be easily reached using the shuttle service offered by the hotel. Regardless of the season, the guests will always be able to taste varied and exquisite dishes served in the hotel’s restaurant, which culminate with the weekly appointment of a traditional dinner inspired by the Dolomites’ flavors. A wonderful view on the lake is the perfect background to each and every meal. Known for my favorite team, Lazio, which has been staying here for years. This Hotel is in the central part of Auronzo, in the breathtaking setting of this beautiful place of Cadore and the Dolomites. I've never stayed here, but I had lunch taking special passes and I can assure you that the Hotel is really clean, well-kept and refined. The Three Peaks of Lavaredo are within the natural Park of Tre Cime and, in 2009, they have been nominated world heritage by UNESCO. The area offers countless possibilities for hiking, for expert mountaineers and beginners alike. Auronzo di Cadore with Misurina represents one of the most interesting ski resorts of the Dolomites. Ski enthusiasts will have plenty to choose from: over 25 km of trails of every difficulty level within the ski resort of Dolomiti Superski. Lake Auronzo is a navigable body of water, where you can also have a swim; it is very suggestive and it is a starting point for many hiking routes in the mountains, to discover del Belluno Dolomites, with their truly magical scenarios. Lake Misurina is one of the most beautiful lakes in Italy and its charme is also due to the legend telling its origin. During summertime, it is an important touristic destination, while in the winter the Lake usually freezes over and you can walk on it. Somadida natural reserve is the biggest wooden area in Cadore and one of the most beautiful forests in the Dolomites. Surrounded by the majestic peaks of Mounts Cristallo and Sorapiss and by the wild Marmarole, it hosts a natural and animal patrimony of great value. The museum, hosted inside Palazzo Corte Metto at Auronzo di Cadore, takes a look at the natural, architectural and geological aspects of the Cadore area through an interesting path aiming to integrate the history of the dolomitic nature into the history of mankind. The park is the perfect place to let the kids play free and have fun in the open air. Situated in a panoramic and sun-kissed location at the foot of Antelao, NeveSole offers its guests and their families a one-of-a-kind fun experience on the snow.